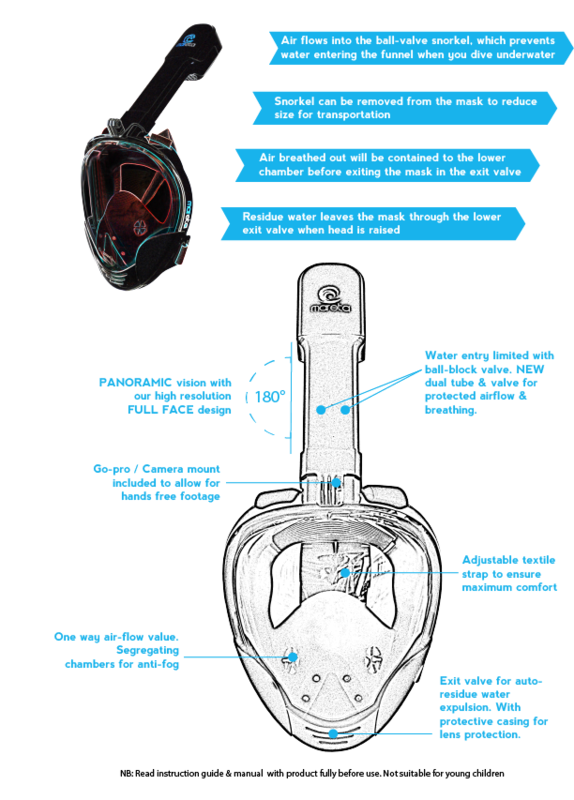 Mareta's premium full face snorkel mask has a dual flow & extended tube so you're taking in clean air - and more of it! With a double-ball valve mechanism in the tube you can still duck dive underwater without the need to exhale any water, so breathing with this mask really is as easy as 1-2-3. With a larger surface area mask and strengthened jaw casing, the M8018 will have you snorkeling peacefully at ease whether you're a seasoned diver or just paddling in the shallows on a family holiday. Remember - as with all our full face masks, you can breath through your mouth and nose so there's no experience or training needed before you jump on in! This mask, designed for surface snorkeling, has an innovative convex lens giving users 180° vision of your surrounds so you don't miss that sea turtle gliding alongside you! Product features are listed in full below along with guidelines.